Filter for a Program and/or Division. You can also include a Schedule, Name, etc. Filtering by a sub-group is a great way for a group leader to monitor the absences for just his group. The Email Attendance Notices contain somewhat similar information, but the email notice also includes recent guests. A staff member triggers these, and they are sent to all leaders in the organizations selected. 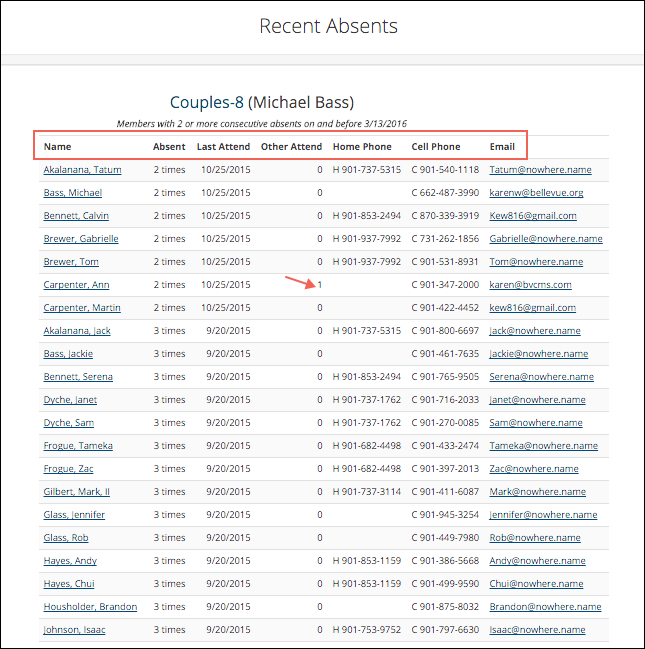 The default for someone to appear on the report is 2 consecutive absences. However, you control that at each organization. For groups that meet for a short period of time (such as a semester) you may prefer to change the Consecutive Absents Threshold to one. See below for suggestions regarding groups with multiple schedules. Absences are tracked for members of the organization, not for guests. So the report only contains members. If a person has never attended, he will not be included in the report. If a person has not attended in more than 3 years, he will not be included in the report. When you run the report for multiple organizations, the list for each class will be under the class header. Also, the name for each class is a link to the organization itself. These will not display on the report as absent. Only those who we expect to attend on a regular basis will be considered for the Recent Absents Report. However, if an Inactive member actually attends, he will display as a Visiting Member for that meeting. If you leave the organization setting to the default, everyone who has missed any two consecutive meetings will appear on the report. If, for example, you have an organization such as the Adult Choir that has three schedules (Wed 6:30 PM, Sun 9:20 AM, and Sun 4:30 PM), you will want to evaluate the report differently than you would for a Life Group that meets only once a week. The last meeting Jane Doe attended was Sun 1/13 at 9:20 AM. She displays on the report (after the attendance was entered for 1/20) as having missed four consecutive meetings. Which is correct. In the case of the choir or any other org with these types of schedules (that is, 3 available meetings each week), change the Consecutive Absents Threshold to 6 and the report will return people who have missed all the meetings for at least two weeks. There is a companion report called Recent Absents Report 2 that is helpful for churches that track individual attendance in worship.